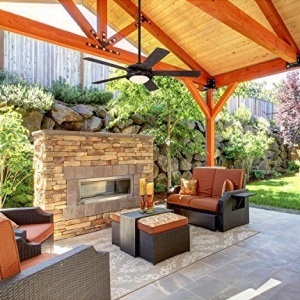 Many people don’t know that outdoor ceiling fans are incredible additions to an outdoor space. The best outdoor ceiling fan is one that is rated for the environment. They can be damp or wet rated depending on the area where they’ll be installed. You can add one to your all-season room or your detached gazebo. They can even work in a space where it’s just a pergola or simple structure in the yard. The outdoor ceiling fan provides added cooling in a space that might get too hot. When it’s reversible, it can be used in areas that need more heat, too. Your all-season room can benefit from a ceiling fan if you have trouble keeping it warm in the winter. This outdoor ceiling fan has 3 blades measuring 52 inches across. The blades are an absolutely stunning solid walnut. They have an oil-rubbed bronze colored finish on them. If you’re looking for a tropical-themed fan for the patio, this is a good option. It’s UL listed for damp locations. It’s not recommended that you use this outside if you live in an area where salt water exposure could happen. The reason you want to be careful with this fan is because it’s made of solid walnut. It does have a protective finish on it, but salt water can erode the finish. To keep the ceiling fan beautiful for years, it shouldn’t be used in outdoor areas near the ocean. The fan includes a 6 inch downrod for installing the ceiling fan. This should be kept in mind because ceiling fans should be at least 7 feet from the ground. Nobody will bump their heads at that height. The 6 inch downrod brings the ceiling fan down that much from the ceiling. You’ll need to have 6 and ½ inches of clearance for the fan. 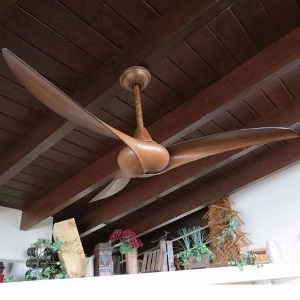 This is a fan that has some great features like the beautiful walnut blades with their 9-degree pitch. That will provide more air when the blades are turning. A remote control is included with this outdoor ceiling fan. The remote is handheld and includes buttons for controlling the speed of the fan. There are three speeds for this fan. In the version with a light, the remote will control the light, too. It’ll switch the entire fan off and on, too. The outdoor ceiling fan is rated for outdoor conditions, but shouldn’t be used in areas with any humidity. It’s not clearly explained by the manufacturer. This fan was designed by an award-winning company that pursues durability and beauty in all their products. They don’t disappoint with this stunning model that’s been recently updated. There are two separate fans on either end of this unique ceiling fan. There are a total of 6 wicker blades. They’re easily changeable for a completely new look without having to change the entire light/fan fixture. The entire fan assembly with blades and light measures 74 inches across. You’ll need to ensure you have a wide enough space for this length. It’s a good size for those wide spaces that need a big fan. An oversized fan also makes a statement in a smaller room. Just make sure that the height is substantial, so nobody gets hurt walking under the fan blades. The blades are completely reversible and come with three speeds for either direction. For the light, you’ll be getting a candelabra base requiring 2 bulbs. The fan itself is damp rated. That means you’ll need to keep some covering over the ceiling fan. It can be out in the wind and rain, but nothing like a complete downpour that soaks into the light fixture. The instructions for this fan are not truly complete. Many customers don’t realize that the fans can also be tilted after they’re installed. This outdoor fan has a unique, weathered style and color. It will fit beautifully in any backyard or outdoor space. It has five lovely burnished pine blades. They look weathered without being old. Many homeowners love an antique, weathered piece of furniture or décor that works perfectly in an outdoor space. The light kit comes with one LED bulb. The light is covered in a clear glass with stunning iron-looking metal surrounding it. The bulb looks like an Edison one that’s covered in a style that is slightly industrial. It’s a fan and light combination that’s rated damp for use outdoors. That’s important for areas where you might get some damp weather. It’s best to keep out of direct wetness, though. It can be used on covered porches and gazebos with some shielding for the light/fan itself. The blades are reversible and can be changed with the touch of a button on the remote. The handheld remote works for the light, too. You don’t have to worry about a pull chain dangling from the fan itself. The fan motor is incredibly quiet, so you’ll be able to enjoy time with friends and family. You can sit directly under the fan, and it’ll never block your conversation. This is a refurbished item that has been rebuilt. In my opinion. This isn’t a negative since any problems will be fixed before being sold to a new customer. 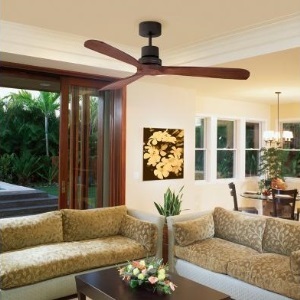 The Key Biscayne fan from Hunter is a 5-blade outdoor ceiling fan. It has an integrated light included in the kit. It’s damp-rated, so you can install it on porches, covered patios, sunrooms, or covered gazebos. It’s a 54-inch outdoor ceiling fan. The blades of this ceiling fan are meant to be weathered and reminiscent of a coastal or maritime style. The blades look like aged beachwood. They’re perfect for spaces with an ocean or beach theme. Even if you don’t live near the beach, you can enjoy this look on your porch along with beach décor. It’s important for your ceiling fan to have a quiet yet powerful motor. It should be able to move air to provide comfort during warm days. It shouldn’t be so loud and powerful that it drowns out a normal conversation. The WhisperWind motor is meant to provide incredibly quiet power to your space. The ceiling fan has a pull chain that will change the speeds as well as turn the fan off and on as needed. There are two chains. The other pull chain flicks the light switch. The fan’s blades can be reversed, so that you can change the direction of the blades in the summer or winter. The light included with this ceiling fan requires a fluorescent CFL bulb. There’s a downrod included with this outdoor fan, so make sure it’ll fit in your space before purchasing. Some customers reported that parts were missing from the box. Before trying to install the fan, take a complete inventory of all the hardware to be sure it’s all included. This indoor/outdoor ceiling fan has silver blades with a 14 degree pitch for great air flow. There are 5 total blades measuring 54 inches across when it’s installed. It’s a newly updated design that will fit in any space where retro or rustic is the design scheme. The powerful motor of this ceiling fan is very quiet. You can have low conversations outdoors under this ceiling fan. It’ll never block a conversation because it’s loud. The a 172 mm x 22 mm reversible motor. This gives you air flow in the winter as well as the summer. There are 3 speeds available in this reversible motor. All of the controls like the speed and light itself are available on the handheld remote. That’s included in the ceiling fan kit and light, too. The blades are weather resistant with its galvanized finish. The entire ceiling fan and light are wet rated. They can be used on back porches, inside gazebos, inside lovely sheds, or on a lanai. With the housing of the motor covered and rated for wet environments, you could even install this on a pergola with open slots at the top. The light uses a 14-watt CFL bulb that is included with the kit itself. If you wanted to use a different bulb, you could certainly purchase an LED equivalent at a home improvement store at a later date. The light is quite large compared to the fan blades. If you’re looking for a fan with beautiful blades, this could be a problem when the light dwarfs the fan itself. This sleek ceiling fan can be mounted in areas where there isn’t much dampness. It’s perfect for an all-season room or covered porch. There is an angled ceiling adapter, so you can install it in unexpected areas that have a sloped ceiling. It’s fantastic if you want to purchase two for a slanted ceiling in a huge space. The fan itself will hang approximately 13.5 inches from the ceiling with the downrod that is included. That measures 3.5 inches. The sweep of the blades is 52 inches, which is standard for most spaces. The adapter for the downrod is what allows the ceiling fan to be mounted at an angle between 21 and 45 degrees. The fan resembles those futuristic, sleek wind generators used out on the ocean. There are 3 fan blades that are quite beautiful and will fit with many themes and decors. The fan comes in white, distressed Koa, or industrial silver. There’s a handheld remote for changing the speed. There are 3 speeds available with this fan. The remote controls the dimming of the light, too. There’s no switch on the remote to reverse the fan’s blades, but that can be done with the reverse switch on the motor itself. Minka-Aire has very advanced technology in their products. This fan works with Alexa voice in smart homes. You’ll need to have a hub installed in the ceiling fan to have it work properly. The Bond hub allows Alexa to work with the fan for complete voice control. The voice control hub has to be added before the fan and light fixture is installed into the ceiling. The hub is integral to the smart home capabilities. 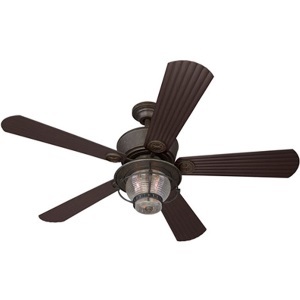 The Emerson outdoor ceiling fan has a low profile, which means that is a flush mount. It doesn’t need to hang far down into the room. This gives you more space between the ceiling and the floor. The fan includes a light that is a candelabra style with halogen bulbs. It comes with two bulbs along with the rest of the fan kit, too. The fan kit also includes 3 sleek looking blades for the fan itself. The fan comes in a variety of colors from appliance white to graphite, oiled bronze, and stainless steel. There’s a 44-inch version and a 52-inch version. This Emerson fan is approved for use in wet locations. This means it can be installed in many outdoor spaces. 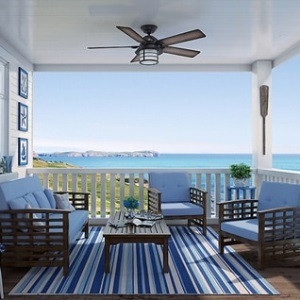 Covered porches or all-season rooms are perfect for a ceiling fan. You can also install this kind of fan in an unexpected place like a detached gazebo structure. The ceiling fan comes with a 6-speed remote control. That gives you a full range of speeds for the blades of this fan. The fan is controlled with the use of Alexa if you purchase the hub separately. This will give you voice activation with your ceiling fan. You don’t have to worry about losing the remote to turn off the light or change the air speed. If you find that this fits your style perfectly, there’s no reason you can’t purchase a few. They come in different sizes with the ability to mount flush to the ceiling or with a downrod. The choice of height will depend on the room’s ceiling height. This has variety that means you’ll have a modern fan in any room of the home or outside structure. The bulbs in this light fixture can run incredibly hot. The bulbs included might need to be replaced with a different kind of bulb. Westinghouse has been a company associated with lighting for generations. It’s no wonder they have incredible choices for outdoor ceiling fans. This is one of their best ones. It’s a 52-inch 5-blade ceiling fan. It’s great for large spaces that need a bit of light and cooling. The ceiling fan is rated for indoor and outdoor use. It’s damp rated, so it can be installed in covered areas that won’t see a ton of rainfall. It definitely can handle the elements outside in a covered area like a gazebo or other structure with a covered roof. The energy-efficient motor will cool areas that are over 225 square feet. It’s perfect for cool breezes outdoors. The ceiling fan provides almost noiseless cool air. It’ll never interrupt your conversations or keep you from enjoying the sounds of nature outside. The motor itself has a lifetime warranty with the company, too. 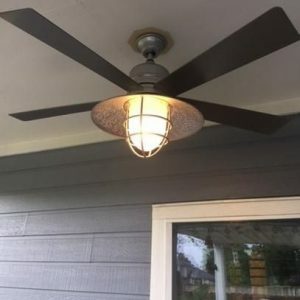 As a ceiling fan, it also doubles as a light. There’s a frosted glass bubble dome that covers the bulbs. It’s surrounded by housing that beautifully matches the blades and other accents of the fan. The fan is available in 6 colors to match any decor you have. If you love the style and design, this fan can be purchased to go outside as well as indoors. It has a summer as well as a winter mode to be energy efficient all year. With the slight tilt to the blades, there isn’t as much air movement as would be expected with a ceiling fan of this type. As a ceiling fan, this one embodies what it’s like to lay in a hammock enjoying island breezes. You can add this to your outdoor area for a tropical feel. The blades themselves are blonde wicker and blonde palm leaf. It looks just like an island ceiling fan should. Enjoy this out near the pool. 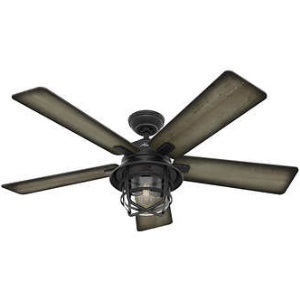 The ceiling fan has an onyx Bengal finish and is damp rated for outdoor areas. You’ll need to ensure that this ceiling fan is installed in a covered area, but you don’t have to worry about mild elements. It has stainless steel hardware that will resist rust. The wide blades of this fan are like paddles. The entire fan is 54 inches across. There are 5 blades to this beautiful ceiling fan. Each blade has a 13-degree pitch, so they provide an incredible amount of air movement. A reversible motor is available, too. That means it’ll give you a downdraft in the summer and an updraft in the winter. This will keep the space at the perfect temperature while saving on energy. This is a refurbished product. This means it’s been returned and repaired, which leads us to believe that it shouldn’t have any issues at all since it’s been inspected again. The contemporary design of this ceiling fan has prompted awards. This isn’t even the old model, this is an updated version. The fan comes from a company that is recognized as a provider of quality, beautiful lighting and ceiling fans. With this fan, you get an old-world, antiqued look without the problems that can come from antique lighting. There’s a lovely antique-bronze finish to give it that aged look you might be trying to get in your outdoor space. This is especially fitting if you have a gazebo structure outside that has an aged or weathered look. It’ll seem as if the two were created a hundred years ago. There are 5 blades on this outdoor ceiling fan. This will give you a ton of air depending on the setting you use. The ceiling fan comes with three reversible settings for as much or as little air as you need in the space. There’s a 6 inch downrod with the ceiling fan. Keep that in mind with the height of your space. You’ll want at least 7 feet of clearance from the floor to the fan blades. This is wet rated for installation outside in any location. As long as you have the wiring in place, or can hire someone, you can install this in an area where rain will hit it. 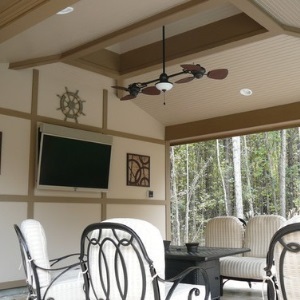 An outdoor shed, gazebo, patio, or lanai is a perfect place for this ceiling fan. To change the speed or turn the light on and off, there’s a remote control. This is where you can change the direction of the blades, too. This makes the fan the perfect all-weather outdoor ceiling fan. Without the lighting fixture, this fan can tend to be loud. Since it comes with a light, that should be installed before the fan is used. What is an Outdoor Ceiling Fan? A ceiling fan is mechanical and electrical. It uses paddles that rotate to circulate air. It’s much like a regular standup fan except it doesn’t have a cage around the paddles. They rotate slower than traditional fans, too. An outdoor ceiling fan is attached to the ceiling of a structure that is open to the elements. It could be installed on a patio, gazebo, or lanai. It’s meant for people who spend a lot of time outdoors. The fan will stimulate air movement on hot days. It’ll deter bugs from settling in the air around the structure’s occupants. The fan might have a light attached to it. That makes it easy to use at night, too. How is it Different than an Indoor Ceiling Fan? The ceiling fan used outside is rated for wet or damp use. That means the fan can be exposed to the elements. Electricity and water don’t mix for indoor ceiling fans. It can cause serious problems if an indoor ceiling fan were exposed to water. The outdoor version is crafted to withstand water, so there will never be any danger. The outdoor ceiling fan is a beautiful addition to an outdoor space. Many homeowners use their outdoor space as an extension of the home. They decorate with furnishings like couches, chairs, and accents. They’ll often have outdoor kitchens were friends and family gather for meals. It’s a place for outdoor parties, too. An outdoor ceiling fan complements the space that’s decorated for entertaining as an extension of the home. It’s a chance for homeowners to pick an element of their décor that might not fit with the rest of the furnishings inside. They can go big and bold or choose a tropical theme that wouldn’t work inside the home. The ceiling fan works as a fan like it would inside the home. It’ll cool down a hot space inside a gazebo or on a patio. At night, it provides lighting. The fan circulates air, which can stop bugs from hovering and attacking as you sit outside enjoying your night. The ceiling fan has its roots in India where Punkah-style fans thought to have existed in 500 BC. The fans back then were operated manually with a rope. They didn’t have blades, either. They were made with a long piece of fabric and a frame that would be waved with the rope to generate air movement. Between the 1860s and 1870s, the first ceiling fans were introduced. They weren’t powered with electricity, though. These first fans were operated using water power. A steady stream of water would move belts that would spin the fan. The fans at the time had two blades. The system was able to move more than one fan at a time. It became popular in stores and offices where people need more than one fan. It was around 1882 that the first electrical fan was created. It was invented by Philip Diehl. He had previously invented the motor for the sewing machine, so he used that same concept with the ceiling fan. Immediately he faced competition for his invention, so he continued to improve on the design. He was the one who created a light for the fan, too. By the 1920s, the ceiling fan was popular in most homes. As homes became outfitted with electric air conditioning, though, the popularity declined. Around the 1960s and 70s, the fan was almost completely replaced with air conditioning. Today, the ceiling fan has come back into favor. They’re used to replace or augment air conditioning because they conserve energy. Ceiling fans are incredibly decorative and are used as featured pieces of a design scheme. They’re especially popular outdoors where air conditioning is not an option. There are many fans that will fit perfectly in your outdoor space. When measuring for a ceiling fan, many people follow the old saying about having a small fan for small rooms and a large fan for large rooms. You’ll want to figure out the square feet of the space by measuring the length and width. You multiply that measurement to get the square feet. That will determine how long the blades should be on the fan. For a space that measures from 225 to 400 square feet, you’ll want a fan that has blades measuring 50 to 72 inches. If the fan has an even amount of blades, you’d measure from the end of one blade to the end of the opposite one. Any size room over 400 square feet might benefit from two sets of ceiling fans. These are standard measurements for most ceiling fans. The fan should be installed at least 7 feet over the room itself. You don’t want anyone’s head to get caught by the blades of the fan. In some designs, a huge, oversized fan might really make an impact. You’ll have to decide if you want to be trendy or stick with traditional measurements. You’ll need to decide whether you’ll be a DIY warrior and install the ceiling fan yourself. If you don’t have experience with electricity as a professional, it’s best to hire an electrician. He’ll have to run wire from the house into the space. If the gazebo is across the yard, that will require more expertise. The installation itself will depend on the type of fan that is purchased. If you’re replacing an old light with a fan, it won’t require an electrician. You’ll be able to install it yourself easily with the directions included with the fan. There’s much to keep in mind when you’re going to install a ceiling fan. Ceiling fans should be energy efficient. They can come with lights and generate less heat than other ceiling fans. You can save money each year on your electric bill while still enjoying outdoor cooling. It might make you think about addressing the current ceiling fans you have inside the home. Many of the choices for ceiling fans will have a label on it. That label discusses the amount of air movement you can expect with each watt of electricity. It’ll definitely help you make a sound decision on the energy efficiency of your ceiling fan. The sound of the motor isn’t something you can avoid completely. The motor has to power the blades. There are some decibel considerations that the manufacturer will list for the product. You can compare them to find the quietest motor possible for your ceiling fan. You’ll want one that doesn’t cover conversation. The purpose of an outdoor space is to enjoy the company of others. You shouldn’t be able to hear the motor over the sounds of nature, either. It should be a quiet, soft hum that you can ignore in the background. The biggest consideration for your outdoor ceiling fan is whether it’s waterproof. A ceiling fan can be rated as a wet ceiling fan or a damp one. The wet ceiling fans can actually stand to be in the rain without being ruined. Those are great for pergolas and outdoor gardens where the space isn’t covered completely. The damp-rated ceiling fan will work on porches and patios where rain might be an issue. They can’t stand direct rain or water, but they’ll work with dampness. 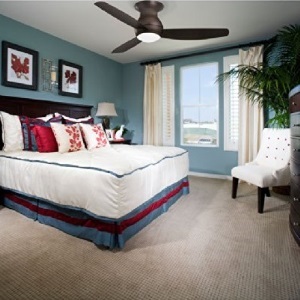 A ceiling fan is a major purchase that requires the utmost confidence in the company itself. It can be scary to purchase from a manufacturer that you haven’t used before. They’ll need to offer the best customer service possible to turn you into a buyer. Look for manufacturer warranties and great customer service reviews from the company before buying. Many ceiling fans have reversible switches. When the fan’s blades move counterclockwise, they’re pushing air down towards the ground. This is used to cool the space in the summer months. A reversible fan can move clockwise, too. This will pull the air up to the ceiling. This is usually done in the winter to remove the cold air from the space. Heated air will rise and become trapped near the ceiling. The fan will pull the cold air up, which will force the warm air back down into the room. This can be a concern in outdoor spaces for a variety of reasons. Think about whether you’ll need a fan with reversible switch for your outdoor area. Some come with remote controls that make it easier to change all the settings. The motor is one of the best features of your ceiling fan. It’ll be the influence behind the energy rating as well as the noise of the fan itself. You’ll want one that has a good amount of power without being incredibly noisy. The blades of the fan are what will give the fan its beauty. The blades can be a variety of materials and styles. There are metal ones with a variety of finishes like stainless steel or copper. There are wood ones with all kinds of designs. Some include wicker or cloth to mimic paddles or leaves. It’s a tropical design that many homeowners want to see in their outdoor space. 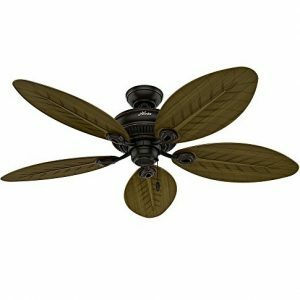 Other components of your outdoor ceiling fan include the motor housing, remote, blade arms, and downrod. Some ceiling fans come with lights, too. You’ll have to decide on all these features when picking an outdoor ceiling fan that will match your outdoor space. Pull Chain – Many ceiling fans are operated with a pull chain. The pull chain switches the fan blades to different speeds. If there’s a light attached, there will be a separate pull chain to turn the light. Variable Speed – There’s variable speeds as mentioned regarding the pull chain. The ceiling fan will have a switch that changes the speeds as well as the direction of the blades. With variable speeds, it’ll give you control over the amount of air that moves through the room. Wall Mounted – There are wall mounted switches for many ceiling fans. That includes outdoor models. The switch might be inside the home if the fan is on the porch or patio. You can control whether there’s juice to the fan with the wall-mounted switch. Remote Control – Since ceiling fans can be so high on the ceiling, a remote control is the easiest way to make changes to the fan. It’ll have buttons for speed, direction, and lights. The entire unit can be turned off and on with the remote, too. You’ll want to be sure that your outdoor fan is placed in a space where everyone will be safe. The fan needs a certain amount of clearance above people’s heads when turning. You don’t want anyone to be injured walking in the gazebo and getting hit in the head with the fan’s blades. Choose the right rating for your ceiling fan. If you’re unsure whether you need a wet-rated fan or a damp-rated one, it’s best to choose the wet rated. You’ll avoid any nasty shocks or disasters when using the wet-rated. It’ll get damp, and everyone will be completely safe. Hire an electrician to install the outdoor ceiling fan. If you’re replacing a current fan, you might be able to do it yourself if you’re handy. For new installations that need new wiring, it’s best to hire a professional. That professional knows exactly what he’s doing, and there won’t be any accidents. Wobbling is a concern for ceiling fans. It won’t cause the fan to fall even if it sounds dangerous. It could cause the blades or light fixture to loosen over time. That can cause injury. Wobbling occurs when the weight of the fan blades is out of alignment or balance. The blades may be warped or installed incorrectly. It’s easily remedied by reattaching the blades. Hunter – The company has been creating ceiling fans for over 130 years. They have a research and development lab that tests ceiling fans to improve their performance. Whether it’s new blade designs or ones that integrate into smart homes, the company is always striving for innovative designs. Casa Vieja – The Casa Vieja brand creates fantastic outdoor ceiling fans for every kind of environment. They have unique styles and designs. Tropical themes, wood, simple elegance, or metallic industrial are all covered with this brand of ceiling fan. Casablanca – In 1974, the company was founded by Burton A. Burton. He would invite customers to step aboard 1940s refinished railroad cars with fans installed. It was a unique marketing concept that would sell 42 million dollars worth of fans by 1980. Since that time, they’re constantly bringing about improvements and design innovations. Minka-Aire – The company has a strong line of ceiling fans both indoor and outdoor. They understand what customers need and will redesign some of their popular fans to fit a certain trend. Open floor plans mean bigger fans to fit larger spaces. They’ve also taken fans outdoors with all-weather ratings for the amount of exposure. Westinghouse – Since the founding of Westinghouse in the 1800s, the company has invented some of the most revolutionary products. They’ve changed the way people light their homes. It’s no wonder they’re a leader in lighting appliances including outdoor ceiling fans. They have classic as well as modern designs and cutting-edge trends in the decorative lighting and fan marketplace. Emerson – This is another company that began its life in the 1800s. They introduced their first ceiling fan in 1895. They were the first to introduce technology that would make ceiling fan motors much quieter. They’re constantly coming up with advancements that make the ceiling fan better, energy efficient, and stylish. The ceiling fan you choose for your outdoor space will depend on a few factors. You’ll want one rated correctly for the environment. If you’re unsure about the type of weather that might impact the space, choose a wet-rated one to avoid damage or injury. To choose the right outdoor ceiling fan, measure the space, find the style that speaks to you, and ensure that it’s properly rated. You might need a professional electrician if you’ve never had a fan in the space before, too. Always do your research and hire professionals if needed.